After speaking w many really cool folks here on the TMC and a couple guys at Planet Nautique forums I made my NSS type plates for my VTX. Shout of thanks goes out to all those guys who know who they are. Went w a 2 pc design and made some prototypes out of plywood and then onto the HDPE boards. Used 1/2" for base plate and taped them for mounting/slide bolts for the slide plate and holes to mount them to the boat. Used 3/8" for slide plate as if something ever hits the plate the 3/8" will likely break before any damage is done to hull ect.. Used big screws to mount to boat and 1/4x20 bolts for slide plate retention with nyloc nuts and one has wingnut w lock washer for manual deployment. 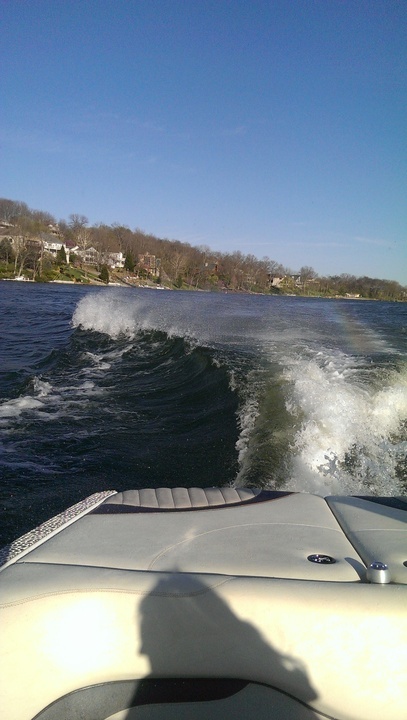 Tested yesterday w windy/choppy water and only stock ballast, wedge down, me and the wife only and potential for wave adjustment and shaping is obvious. Made a huge diff in wave shape and push. Pics won't do it justice but will include a few for reference. Obviously more ballast and crew will make it even better and most guys I have spoke with the NSS style plates is 60/40 rear ballast/crew weighting will get the job done. 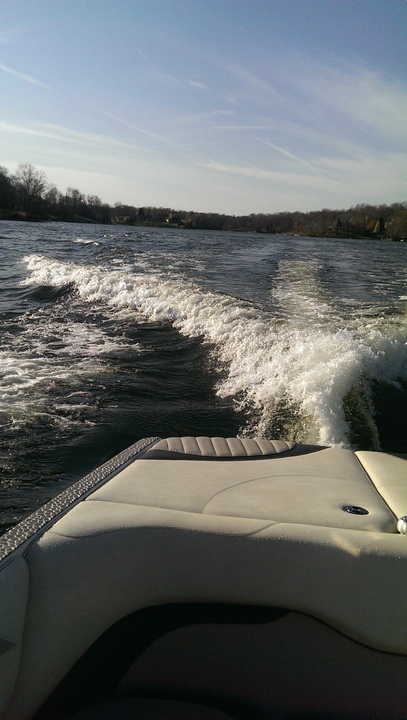 Hoping the water temps creep up some soon so we can ride. Again, thanks to all I have spoken with and hope this helps those who pursue the projects of wave shaping. Wave pics, (factory ballast only w wedge down, me and wife in the boat) Frothy one, no surf plate, curled wave surf plate deployed. Can't wait till we have it slammed with full ballast bags and typical crew of 5-9 folks. Will post follow up pics when we finally get out to surf. ^^ awesome... That 2nd pic looks like my G23 stock ballast NSS wave..... almost identical. Can't wait to see it slammed! Wow, that's more than I was expecting. Looks great. Make sure you let us know how your first hand experience behind it is. Well done, nice design concept. So it looks like you manually deploy with the handle? What material did you go with? How much did it cost you? Nice work. Looks like it turned out really good. looks good, it doesn't look like there is room to add lenco's to that system is the only concern i have. I think the NSS idea is better than a gate for retrofit. NSS G23 with stock ballast only, almost exactly the same wave H20 got on his 08 VTX. Seriously geat job H20. now lets max 750-1100 in that surfside locker, 350-500 in the other locker, and 750 in the walkway/bow, 11.6mph and let her rip! Wow! HUGE difference! Nice work, man. So the base plate has 7 holes that were drilled into the transom, those were not thru-bolted, just screwed in, correct? 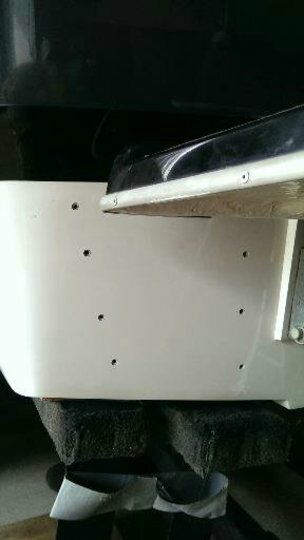 Also on the base plate there are 4 holes on the left that do not line up with a hole on the transom, what are those? How do you keep the 1 bolt with the wingnut from spinning when tightening, did you glue the head into the HDPE? The four holes that don't line up? On outside edge? 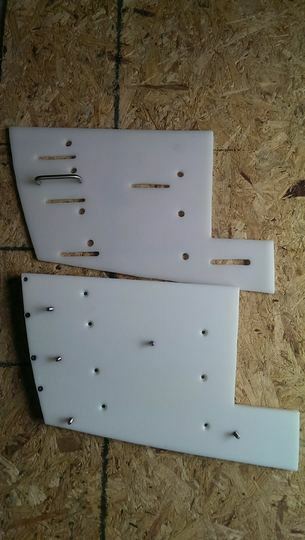 If that's what your asking about that's the filler piece mount screws for piece tween plate and hull, see side view pic. Gotcha, now I get it. Thanks. How did you determine what length to extend the slide out? Sorry for all the questions, but it looks like the perfect solution and I am very interested in duplicating that. Looked at all the Nautiques at the boat show, spoke w owners who have NSS and a few other sources at a dealer who gave me a lot of info on the NSS development and seems that anything over 3" seemed to add too much delayed convergence and wave did got curl over w the push we all want. Someone might want more lift off bottom but 3/4" of plate out was average on all I saw but one and it was only 1". Great design, is this something you drew on a cad system? sure would be nice to be able to water-jet out the design. I really like how simple and user friendly your system is. Great Job. cbmailbu98, thanks man. Actually did not draw it out on cad. Have seen some stuff similar in another industry I worked in years ago and another guy on Planet Nautique forums and I had discussions and he had made one similar last year but I had so much on my plate last summer due to death of our son and my dad's health and eventual death that I just could not get the project done. With so many hulls being different I just made a template from wrapping paper and then cardboard and then plywood to come up with prototypes and then onto the HDPE materials. Tao of the Wake, nyryan2001, martinarcher, and a few others helped me in the brainstorming dept as well along the way. I think this could be adapted to a lot of hulls fairly easy as Nautiques just use shape of given hull and add the NSS as far as I can tell. Plates, gates, tabs, it's just about creating delayed wake convergence so as to get a nice rollover and good wave push. 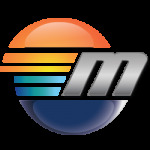 I'm glad to contribute as so many have helped me over the years and the TMC forum is a great bunch and humbled that many like my basic design, so thanks again. Hopefully it can be replicated for others to benefit and make wave shaping device for their boats as well. All of this was done with basic tools, hi quality jigsaw, drill, taps, dremel, (and grinder for the side piece, to get the shape/contour to follow hull and keep "spray" issues to minimum). So most anyone handy should be able to make their own for their boat. Tao has a nice 3 piece system as well, he did a great job and inspired me to commit to mine. Kudos to him. Sorry to hear about you loosing so many close family members in such a short amount of time. I would like to offer my condolences. Since you don't have a CAD file and there are so many variances in hulls between the models and years I just wanted to get some clarification on the design. You have basically three pieces. 1. 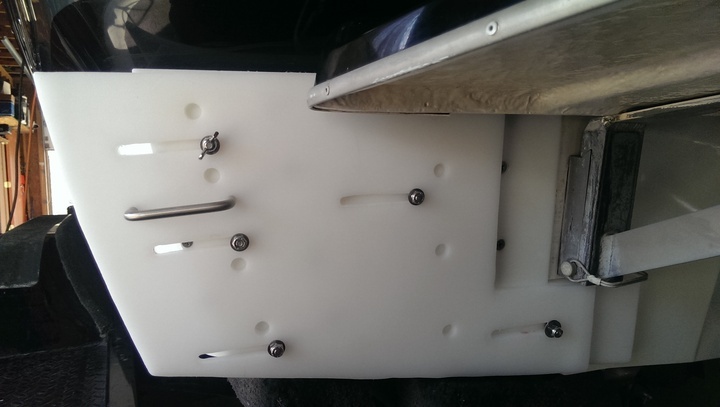 Mounting plate. 2. Sliding plate. 3 Filler plate. 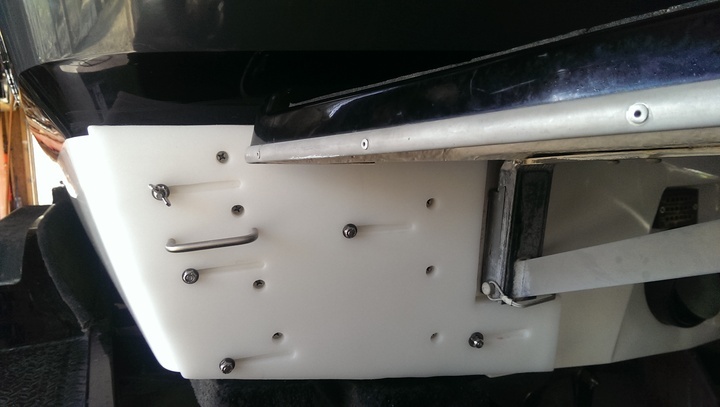 From my understanding the mounting plate is solid on the hull and basically holds pins that align and direct the sliding plate. The sliding plate slides out creating the delayed convergence. Direction and distanced is dictated by the mounting plate. The area I'm not 100% on is the filler plate. I'm assuming it fills any gaps between the hull and the mounting plate. But I'm not sure how far out the mounting plate is compared to the hull or platform. Can we get some picture from above to see the exact layout and placement? From what I can gather, it appears max 3" out the side of the hull & 3/4" below the bottom of the hull appears to be ideal. The 3/4 from the bottom of the hull I understand since the bottom to transom is a fairly sharp corner. The max 3" from the side. 3" protruding out the side if you had a straight edge down the side of the hull, or 3" from your mounting block which appears to be set back where the side to transom radius finishes. Just trying to get my head around where the 3" is measured from. On a side note, you mentioned you have a work around to mount actuators to this design. Be keen to understand what you are planning. Hope you have a much better season this year. First, thanks for condolences, appreciated. jesutton3, yes, three piece design, you are correct in all statements. The "filler" piece I made was to keep splashing effect down to minimum. As far as I how far out the plate is to edge of hull pics don't really show well as ya have to eye it cause my hull rounds somewhat to transom, so I had to actually trim down my prototypes a little bit as they stuck out to far and water flow was affected negatively. Fell free to PM me and we can talk as I not sure about the pic request your looking for. Andrew63, I went with the 3" as that's what I measured and looked at and spoke to others about, seems bout right for most if not all hulls from what we can gather. The 3" is in fact travel on base plate and given radius of the hull I can only guess how much it actually sticks off the hull cause hull is slight radius as well. I went with what looked right and made the "filler" piece to clean up the look and reduce splash effect, but it def gets the plate "eyeballed" even with side of boat and have no water flow issues when non deployed. Also used a 3' long level to get edge line down side of boat to see how far plate needed to "come out" due to the radius and that helped come up w final sizing ect... As far as the actuators, one end mounted on the sliding plate, approx where the manual handle is now, (similar to Tao of the Wake did his) the other on fabed bracket on swim platform, a friend of mine builds race buggies for mud, sand ect..and can fab anything. That explanation cleared it up. So the 3" extension is measured from the edge of the mounting plate or from the flat side of the hull? Slide plate extends 3" from mounting plate. Plate seems to be "even" with the hull when ya look down the side of it and with the level we used to determine the "edge" of transom had it been squared and not rounded to transom. In discussion w others it really just comes down to delaying the convergence. If ya look at Tao's plates his are lower than mine off side and he's still getting good results. Moomba has a plate, others have tabs ect,ect, just delay the convergence effectively and it should work. I just liked this system cause it's simple and if slide plate were to get damaged it's easy to replace, and the system just works from all I have seen. 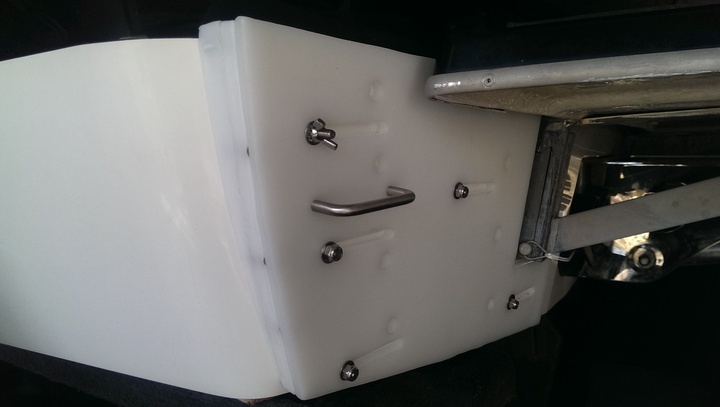 Do you remember what size screws you used to mount to the transom? Put together a cardboard template last night. And ordered up some black HDPE this morning. So it looks like I'll be giving this a shot! #14's 3/4", 1" poked thru carpet and could pop a ballast bag. Word of advise, practice and holes and countersinking and thread taping on scrap piece of HDPE. I found a 1/2" somewhat dull drill bit worked best as sharp bit grabs into HDPE and would go deeper than necessary. You would have 12 holes in total countersunk, 5 for slide plate threaded screws/bolts, and 7 for base plate mount to boat, 5 on one side and 7 on other of base plate. Also, countersink holes first and then tap thread holes slowly, HDPE does not like the heat and threads hold and turn out better threaded slowly. Used Loctite and ya should use Loctite primer on stainless so it will set up correctly. Helps hold threaded bolts in so they won't back out on ya if ya have to take nyla nuts off/on and when adjusting wing nut to slide the outer plate out for use. HDPE is so slick hardly anything will hold in it but the Loctite dried correctly held threaded screws well. I used a star type lock washer and washer under wing nut and does not take much pressure for it to hold plate stored or deployed. Also, I was told NOT to use the 3M 5200, use hi quality silicone sealant for screws into hull as ya might never get them out if ya use the 3m stuff in the screw holes. The guy who told me restores wooden and classic boats. He has learned the hard way he told me. Like I said, made some prototypes from plywood and just copied them onto the HDPE, plywood a lot cheaper if ya make mistakes to learn with.Hope it works out well for ya. Nice little project! I love seeing guys having a go at this sort of stuff! It's so satisfying to see the results after all the hard work is done. 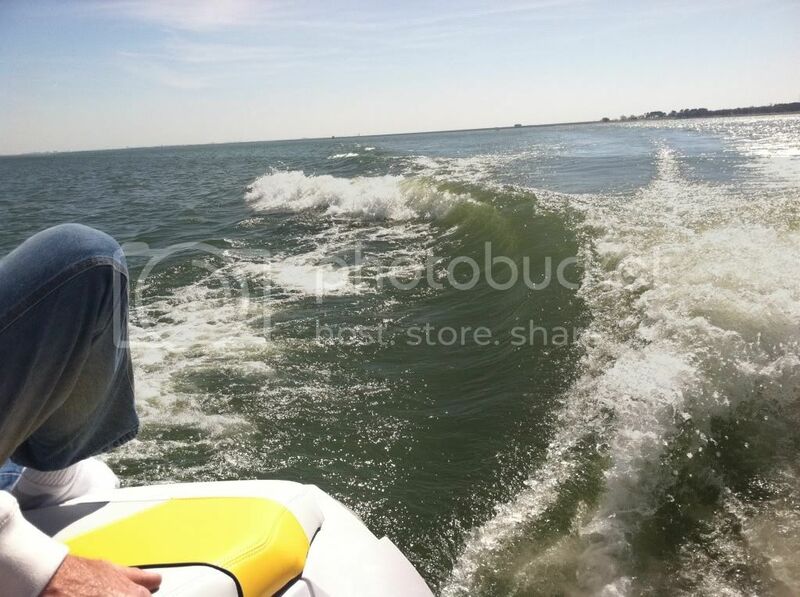 I know I got that warm and fuzzy/new boat feeling after I did my NSS build, good work! Cool stuff! But I am a little surprised that HDPE doesn't flex like crazy. Let us know how it holds up!